This weekend, North Tarrant Infrastructure will be placing beams at NE 28th St. over I-35W. 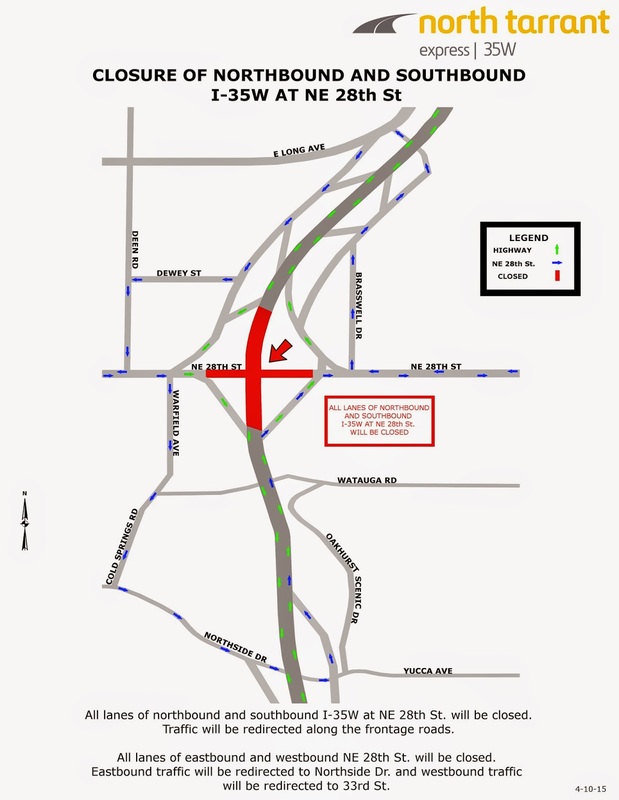 In order to complete this operation, all lanes of northbound and southbound I-35W at NE 28th St. will be closed from Friday, April 24 at 9pm to 10am Saturday, April 25. Please note that if weather impacts the operation on Friday night it will be rescheduled for Saturday night. Drivers are encouraged to “Know Before They Go,” and visit www.northtarrantexpress.com for upcoming closures. To view detour maps, please visit the Alternate Route Map page of our website. Also, as our lane closures are updated frequently, please visit the Lane Closures page on our website daily for the most current information.